Anyone wandering into the UN Diplomat Dining Room looking for dinner on Monday might have thought they walked into a parallel universe. Ambassador Ron Prosor, Israel’s Permanent Representative to the United Nations, was explaining the philosophy behind Israel’s newest postage stamp. “With this stamp, we give our stamp of approval” he said, “to the man who wrote the first known human rights declaration, a king who believed that all people can live side by side in peace, and that everyone is entitled to religious freedom. King of Persia, Cyrus the Great”. The ambassador then introduced three renowned scholars, Dr. Irving Finkel of the Department of Middle East at the British Museum, Professor Faribortz Mokhtari of the Political Science and Economics Department at the University of Vermont, and Dr. David Menashri from the Alliance for Iranian Studies at Tel Aviv University, who enlightened the audience about the extraordinary man who is an ancestor to the Iranian people and was king of the country that is predecessor to Iran. The event was co-sponsored by the Iranian American Jewish Federation of New York. “Thus says Cyrus king of Persia, All the kingdoms of the earth has Adonai, the God of heaven, given me; and he has charged me to build him a house in Jerusalem, which is in Judah. Whosoever there is among you of all his people, his God be with him, and let him go up to Jerusalem, which is in Judah, and build the house of Adonai, the God of Israel he is God, which is in Jerusalem.” (Ezra 1:2-4; cf. also 6:2-5). 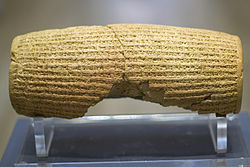 The Cyrus Decree is archeologically corroborated by the famous Cyrus Cylinder. The biblical book of Nehemiah is especially worth reading, as it demonstrates the historical eternal bond between the Jews and the land of Israel even back then. Nehemiah is well-off, living happily in Shushan (ancient Persia the city of the events leading to Purim) when he hears that “the wall of Jerusalem is breached, and its gates were burned with fire”. He cries and mourns, and finally springs into action. He makes Aliyah and organizes the Jews to rebuild Jerusalem’s walls. Just as in modern times, when Eurabia, Mohamedans, Hadrians-Israelis (that manipulate US White House & US Dep’t of States) & some local bedouins nomads hear that the Jews are rebuilding Settlements , Jerusalem & maintening ancient walls they react violently (Nehemiah 4): “Now it came to pass when Sanballat, and Tobiah, and the Arabs, and the Ammonites, and the Ashdodites heard that the wall of Jerusalem was repaired, that the people who were exposed had commenced to be closed in, that they became very angered. And they all banded together to come to wage war against Jerusalem and to wreak destruction therein”. really! you should have donated one to God, after all he is the one who looks after you! Israel is still too secular to issue a stamp in the name of God. Persia was a great civilisation till it fell to islam. Ambassador Prosor says: "“I hope the people of Iran look to the principles of the Cyrus declaration…" so it seems he has no idea what is going on in Iran! because the Persians respect the ideas of Cyrus and they are a pro-peace and pro-freedom nation. The problem is the 'government' of Iran; a reactionary religious system which came to power in 1979. People of Iran many times (1999, 2009,…) have proved that they do not want to have this system in their country. Dear James, even after Islam Persia has been a great civilisation as well. If you read even one book about the Persian history you will find out. The problem now is a very complicated system which no one knows how it should be removed from the country. Let's just hope they can take back their nation and reshape it into a home they can love and be proud of. Pejman Akbarzadeh I must say, well said. I am not afraid to admit when I am wrong, thank you.